Okay, here’s what we did. We screened the *Tears of Joy Edition of The Best of Me here in the EncinoMom screening room on Sunday! Before the movie (which arrived with a box of Kleenex – I’m not kidding) we had some tasty samples lined up for our guests. Here’s a snap of the SusieCakes cupcakes before we even took them out of the box. The cake part was perfect – read – not a crumb left on anyone’s plate – and the frostings were swoon worthy. Sigh. Ultimately, we decided to watch the theatrical release version of the movie because none of us would watch it if we saw the storybook “Tears Of Joy” ending first. So the Kleenex turned out to be a very good thing to have on hand in the studio! When guests first arrived, everyone commented on how good it smelled. I credit the tea and the scented candles in the goodie bags, even though we hadn’t lit any of them, yet! The tables were laid out with vintage tea cups and ladies’ luncheon plates. You can definitely tell the plates are authentic because there is an ashtray molded into each one, so ladies could smoke while enjoying their lunch. Seems outrageous, now, but I imagine these plates were used at fashionable gatherings where the women wore gloves and girdles. Vintage tea cups and saucers with a teapot my daughter made at Color Me Mine when she was 3. We sampled the new Kale Caesar Salad from the Corner Bakery, some Davidson’s Safest Choice Eggs (which I used to make egg salad sandos with cucumber) and then we tucked into some amazing cupcakes and treats from SusieCakes along with a limited edition tea from Teavana, created especially for Valentine’s Day. 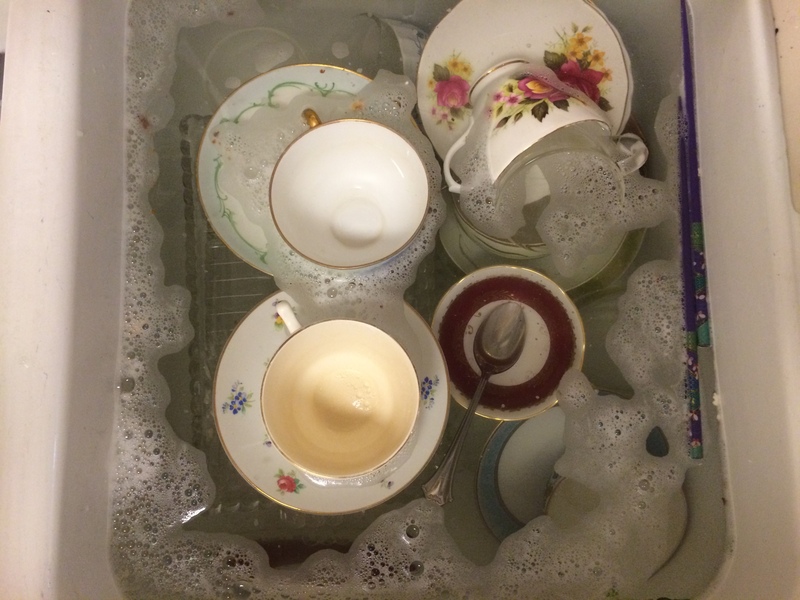 The ashtray is in the lower right hand corner of the dish – the empty area next to the punch cup. 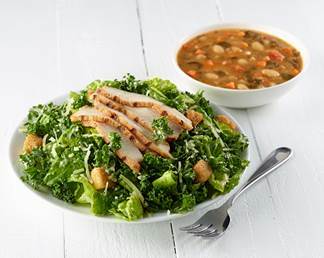 Click to see the Kale Caesar (under 600 calories when paired with soup from The Corner Bakery’s 100 Combos Under 600 Calories Menu). The dressing is perfection. The First Blush Tea from Teavana. The color and flavor of this tea are exquisitely subtle and lovely. The First Blush Tea features naturally scented Jasmine green tea blended with floral orchid oolong complemented by luscious strawberries, crisp rhubarb and effervescent undertones of bubbly rosé. It arrived in a big box with surprises that we put into goody bags. Available at Teavana stores and online. This tea smells amazing! It is lovely and subtle and beautiful, too. We used the Perfectea maker pictured above. It’s so simple to use and ensures that your tea comes out just right. It’s especially helpful if you’re a lazy tea maker like me. I tend to leave tea to steep too long which results in bitterness that no amount of milk and sugar can remedy. Here’s Teavana’s Perfectea Maker in action. So simple. Hot water goes in the top. Tea comes out the bottom. So much to taste and talk about! The tea also came with this Pairing Tip: blend iced First Blush Tea with a glass of champagne for a fun and easy to make Teavana cocktail. Thanks to SusieCakes for the perfect assortment of sweets to go with our salty tears. We knew just about everyone on the guest list would be down with that so we picked up our favorite Brut! This was a big hit and was the perfect complement to our menu. We added a few fresh raspberries and hibiscus flowers in rose syrup to the champagne/tea cocktail as a beautiful blushing garnish. The soft color of the tea makes this a perfect choice for Valentine’s Day. Surprisingly, we sweetened the tea slightly with a few crystals of Teavana’s Perfectea Rock Sugar for just the right blend of flavors in the champagne cocktail. The egg salad sandwiches were light and mild and layered with leaf lettuce and Persian cucumbers for a new take on traditional crustless tea sandwiches. So Sunday was like a mini restaurant tour and product Expo! We had a great time together which of course was the point of the whole thing and our guests were encouraged to take pictures and post to Instagram, Facebook or Tweet, Flip, Pin, Kick, etc. to share the fun. Here’s a shot of the movie in progress! You can click it to view the trailer. One more beauty shot of the sweets. You can have an event like this at home with your friends and we can help! We’ve got one copy of the *Tears of Joy Edition of The Best of Me on Blu-ray and DVD to giveaway. Follow the link to enter on Rafflecopter and don’t forget to leave us a comment! This post may contain affiliate links for your convenience. Your purchase may result in revenue paid to EncinoMom. Thank you for stopping by, your support means the world to us. We welcome your comments and questions and appreciate the opportunity to share our experiences with you. Cheers, Mom. Parting shot. When all is said and done, a little hand washing allows for quiet reflection on the friends and festivities of the day. How sweet it is.